They are in the phylum Arthropoda, the class of Insecta, of the order Diptera, and in the family Chironomidae. All that to say that snow flies are non-biting flies, commonly called midges, but perhaps we should back up a little bit and explain the 'snow fly' thing. Many years ago in a kingdom far away I moved from a mythical place called Michigan to a very real paradise, or so I thought, the State of Montana. Montana really is a state, a state of mind that exists mostly in the psyche of fly fishers, snow boarders, and other escapists. I arrived in the middle of winter, a real, bone-chilling winter with snow _____ deep on a tall Native American. Being much younger then, I was undaunted by this reality, and since I had moved to Montana primarily to fish for trout I thought that is what I should do. Upon inquiring at a well-known local fly shop I was informed that I would need some 'snow flies.' Thinking that the locals were planning on having a good laugh on a Midwestern flatlander I asked to be shown some 'examples' of these so-called snow flies. The clerk pointed to several boxes of flies prominently labeled 'snow flies.' 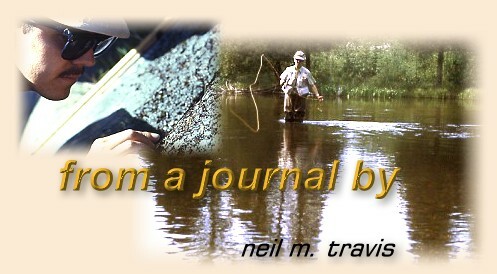 They were small black dry flies that resembled the midge fly patterns that I had used on the Au Sable in Michigan. Ah, an epiphany, snow flies are midges. Against what seems to be insurmountable odds midges hatch throughout the year, even during the coldest part of the winter. On many trout streams midges compose the bulk of the insect biomass and are consumed by trout in every month of the year. On my first winter sojourn to fish the Yellowstone River I discovered that despite the fact that the water was ice cold midges were hatching, and in certain areas fish were rising to eat them. During the winter months on the Yellowstone River near my Montana home I have witnessed heavy hatches of snow flies on days when the air temperature was hovering just above freezing and ice would form in the guides of your rod after every cast. During such cold periods most of the rising fish are Rocky Mountain Whitefish, which tend to feed at colder temperatures than trout. Despite cold winter weather conditions a period of sunny weather will bring the water temperature up slightly and trout will begin to feed on snow flies. 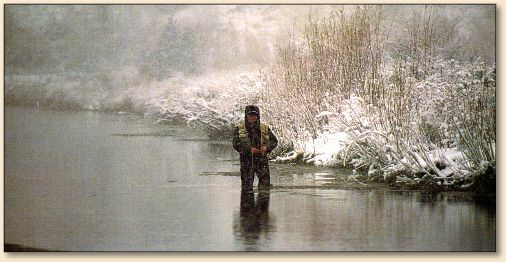 Winter fishing is a true gentleman's sport. No need to rise early since nothing will be happening until sometime after noon. No need to plan for a long exhausting day on the stream since the action will normally only last a couple hours. You only need a few patterns to match the hatch so you can take a lot of those extra fly boxes out of your vest. It's probably best not to wear those lightweight waders that feel so good when the temperatures are approaching the 90's so it might be a good idea to break out those 5 mm neoprene boot foot jobs. My favorite place to fish with midges [snow flies] during the winter months is in the foam that forms in eddies along the banks. These small foam covered whirlpools trap the hatching midges and deliver them to the waiting trout like a lazy susan. I prefer to us a two-fly cast; a black adult midge with a midge pupa trailer. As the foam lines change with the currents the rising fish will shift with them to feed on the trapped flies. I use a slack line cast and drop my es as close as possible to where the most fish are rising. Normally I cannot see my flies in the foam but I can usually see my leader, and I occasionally use a small yarn indicator attached to my leader at the knot where the tippet is attached to the leader point. The very finest winter midge fishing is found on the spring creeks south of my home. During the winter months the extensive weed beds that are characteristic of the creeks during the warmer months are gone, and the trout are extremely shy. On warm cloudy days, especially in late winter, midges hatch in profuse numbers and trout noses poke through the surface to partake of the bountiful feast. It's not heaven but it's as close as a fly fisher is likely to experience this side of the pearly gates. Midge fishing is some of the most demanding angling that most fly-fishers will experience especially on heavily fished waters. There are few angling experiences that are more frustrating than watching several large trout feeding with abandon and completely ignoring every fly that you attempt to feed them. To be consistently successful when using midges the angler must be a competent technician of tackle and technique. Most midges that hatch on flowing water are relatively small ranging in size from a size 16 to 28 or even smaller. I admit that my success decreases markedly when using midge imitations smaller than 24, and fortunately most of the fishable midge hatches that I encounter tend to be composed of insects in the 18-22 size range. The small patterns that are necessary to match the size of most midges' calls for fine tippets; however, except on rare occasions, I rarely use anything smaller than 6x. Modern tippet material allows the angler to use larger tippet sizes without affecting presentation. I generally use 5x tippets for all my midge fishing except when I am forced to use midges smaller than 22's. When fishing to trout that are rising to hatching midges anglers can increase their hooking success by using two flies. If the angler believes the trout are feeding on the emerging pupa a proven technique is to use a larger dry fly that the angler can see and trail a midge pupa off the hook. The larger dry fly acts like an indicator allowing the angler to see when a trout takes their pupa imitation. I generally use an adult midge imitation and trail a pupa off the hook. By careful wading I can usually can get close enough to the rising fish to make a relatively short cast that allows me to either see my imitation or my leader point. While I generally avoid using them the angler can use a strike indicator attached to leader. Since midges are very common on most trout waters midge larva imitations are great searching flies when there is no surface activity. Midge larva colors range from blood red to various shades of olive and most of them can be successfully imitated by very simple patterns. Fished dead drifted close to the bottom below riffles and below heavy weed beds can be very productive. In clear spring creeks I especially enjoy 'sight fishing' with midge larva patterns.